My name is Cullen Pittman and this is my very own internet comic called Rebusquest. This is a funny and educational series about a 12 year old boy named Carson who is a fan of rebus puzzles. Until one day, he solved a magic rebus that transported him to a magic land where rebuses are a part of life. There, Carson meets his guide, a sassy teenage elfan girl named Reba. Together, Carson and Reba travel through many strange lands and meet crazy characters who gives them objects that will form rebuses which will lead our heroes to the next lands in hopes of one day, Carson will be able to return home. 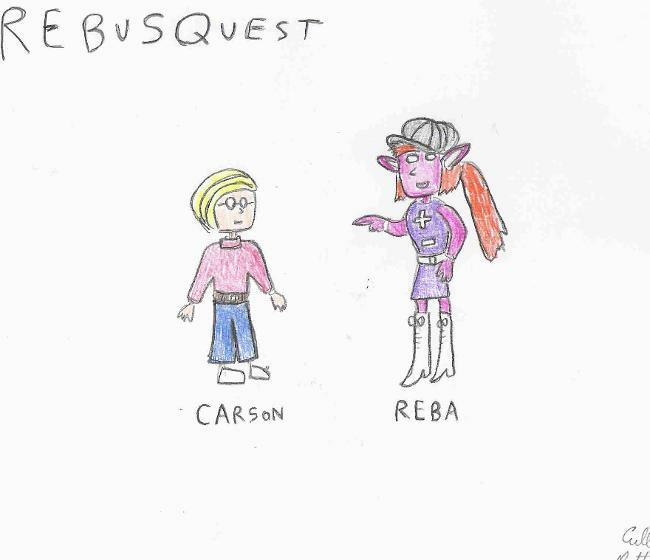 In this very first story, a boy named Carson solves a magic rebus that takes him to the magic universe of Rebusquest where he meets Reba the elf for the very first time and they have their first rebus finding adventure together. We find Carson and Reba lost at sea and then wash up on an island with plenty of food. The only problem is, "THEY'RE THE FOOD!" Carson and Reba find themselves on a farm where they help a brown nosing farmer with a Scavenger problem. Carson and Reba find themselves in a giant toy kingdom. Actually, in a giant cyclops's yard. Carson and Reba end up leaving Rebusquest and enter an even stranger world. A world of video games from the 80's. Carson gets nervous when he thinks Reba plans to take him to a place full of nightmares, but is this land scary after all? Carson and Reba visit Water Park Land, where they meet a pop star squid, an otter mayor, and a big blue creature from the big blue sea. While crossing a hot desert, Carson and Reba meet riddle loving sphinxes, a sacred pyramid, and a sacrilegious villain. While traveling through the snowy land of Freezerberg, Carson and Reba get caught in a war between Peng-Ones and Peng-Twos. Reba takes Carson, who has this huge fear of germs, to a land of many germs. When all the rabbits and rabbit look-a-likes start disappearing in Rebusquest, it's up to Carson and Reba to save the disappearing bunny species. Carson and Reba visit a land of living donuts and they meet a letter "Q" who asks a questionable favor from them. Carson is still stuck in Rebusquest, and on his 13th birthday too. So, Reba and the rest of the RQ gang try to make his birthday a little happier. Carson and Reba accompany The Watch Doctor to his homeland known as Timeland and they meet the master of all time, Father Time. While traveling through Wild West Land, Carson and Reba enter a town of very unusual, but appetizing looking citizens. Carson and Reba meet a famous racecar who appears to be missing her driver and is looking for a substitute. Carson and Reba enter a town filled with banned from kids' TV monsters and they have to find someway of getting through without Carson getting eaten. Carson and Reba end up going on a crazy Christmas quest. Rebusquest, ep19: Storm Watch It! Puzz McPuzzler captures all the pluses and minuses, along with Carson and Reba, and banishes them to Storm Land. Carson and Reba take Syrus Cyclops's son, Eye-van, to his first day of pre-school and end up meeting an old first story foe. Carson and Reba visit Gambleland where Reba makes a bad deal with a green colored mob boss. Our heroes get caught in a martial arts tournament against a team of anime parody warriors. Carson and Reba try to help The Watch Doctor clean a bunch of sugar crazed tooth people before they all face cavity consequences. Carson and Reba enter Bagpipeland where they meet a lovely lass who owns a castle and a shocking surprise. In this unusual episode, Carson and Reba enter Pineland and things get awkward when they start sneezing at the beginning. The regular cast members of Rebusquest get caught in a crazy mystery when they visit an inn. Carson and Reba enter a mountain climbing race so the living magic mountain can give them the rebus they most desire. Carson and Reba enter Valentine Land and have to help a rookie cherub, who is very familiar, spread some love. The regular Rebusquest gang enter a hockey match to save a fragile land from being demolished. Carson and Reba attend Squidia's one squid opera show, until they get attacked by The Banshee of the Opera. Carson and Reba enter Luauland, and Reba causes a royal incident when she starts enjoying some pineapples. Carson learns that Rebusquest citizens don't keep their brains in their heads, but are kept in a special land. When Carson gets kidnapped by a tribe of angry turkeys, Reba and the gang become pilgrims to go save him. Carson and Reba return to MonsterTown, where they help their old friend, The Tea Drinking Monster, save his failing tea shoppe. Carson and Reba go back in time to the stone age to stop the villainous Puzz McPuzzler from destroying the very first rebus ever. When a dreaded natural disaster approaches Farmer Brownnose's farm, Carson and Reba try to help him protect his animals, plus helping out the cause of this so-called disaster. Lass McPuzzler ends up taking Carson prisoner, but only as a date for her school dance. Carson, Reba, and Syrus Cyclops get sent to the moon, thanks to a tribe of giant rocket women known as Amazooms. When Carson somehow gets mutated into a giant vegetable, Reba and the Watch Doctor have to cure Carson from the inside. While visiting a county fair, Carson meets a mysterious gypsy who claims she can grant his desires to finally return home at long last. A land of living sausages gets constantly attacked by a series of blood hungry vermin. During New Years Eve, a giant creature steals the eyes of all the Cyclopses in Rebusquest, including the eyes of our heroes. Carson and Reba try to save a land of cursive letters from becoming obsolete and disappearing forever. Carson and Reba try to help a fire chief solve the mystery of why hydrants keep disappearing in the city. Farmer Brownnose creates an invention that turns junk mail back into trees, but would it be good for nature or not? It's Easter in Rebusquest,. But instead of a bunny, their version is an Easter Buggy. Carson and Reba find themselves in a land where genies are now free from granting wishes, but have other hobbies. Our heroes and villains go on a cruise and get invaded by cute pirates. It's Election Day in RebusQuest. But are the two candidates running good for the land or totally bad? This is my second cartoon series called X.O. Seal. 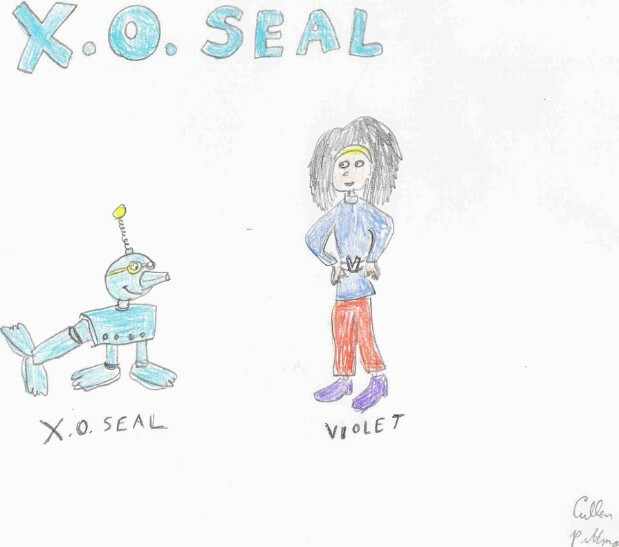 The superhero series about a cyborg seal who fights crime and lives with a teenage girl named Violet Eastway who always tries to hide X.O. from her superhero hating poilce inspector father. In his very first story, X.O. Seal travels to the past and meets his new friend, Violet and his new arch enemy, Woolcap. In X.O. Seal's second story, X.O. 's enemy, Woolcap, escapes from jail and he causes chaos at a bank along with his Livestock Mob. All of Dinky City is having a green algae filled water crisis. And causing it is an unusual fishy-kitty villain. A mysterious Turkish woman gives X.O. Seal a gift that makes him happy. Too happy that is! If square things deactivate X.O. Seal and round things turn him back on, what will happen if our seal hero comes in contact with something triangular? Woolcap hires an evil chick genius to turn everything in the city into squares making it very hard for X.O. Seal. Both X.O. Seal and Inspector Eastway receive ransom notes saying Violet was kidnapped by the Livestock Mob. Now the cop and the seal are forced to work together to avoid the traps of each mob member. Dr. Peepers tries to mess with former planet Pluto and X.O. Seal has to blast off into space to save the day. When the Livestock Mob steals Dinky City's New Year diamond drop ball, ghostly chaos happens on the New Year. X.O. Seal, ep10: Seal, Seal, Goose! An old goose lady with a magic book uses nursery rhymes to commit crimes. It looks like X.O. Seal has turned to the crime side. Can Violet prove his innocence? Both X.O. Seal and Inspector Eastway bump into each other when going undercover to find out why tigers keep disappearing. When a mysterious taxi cab blocks Violet's and Inspector Eastway's path, it leads to a crazy super adventure for X.O. Seal. A vengeful dog kidnaps the city's dogcatcher and all the other dog owners in Dinky City. A strange radio song transforms everyone in Dinky City into their favorite types of music. X.O. Seal become a hairless powerless seal when The Livestock Mob remove his armored hide. X.O. meets another old friend from his superhero academy days. Someone really glassy. All the famous internet cat stars seek revenge after people started favoring seal pics over them. This here is my third cartoon series. 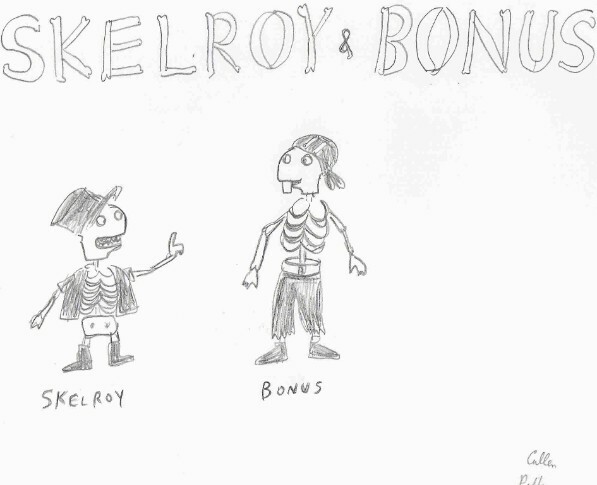 Skelroy and Bonus. The story of two skeletons who always injure themselves doing crazy motorcycle stunts. Then they give us safety tips telling us not to do the dangerous stuff they just did. In their first story, watch what Skelroy and Bonus do with a clump of eaten Buffalo wings and other side dishes. In Skelroy's and Bonus's second adventure. The skeletons lose their bikes in a so-called accident. But Skelroy finds a way to deal with not having his bike, with the help of Bonus. A new sheriff in town forbids the skeletons from doing a stunt they've planned for years. So Skelroy comes up with a plan involving Bonus, Dilly Putty, Spray on Tan, and the heart of lawful woman. Skelroy and Bonus discover a dinosaur skeleton in a museum and remembered it was once their beloved pet back when they were cave skeletons. And they try to bring it back into their lives, I mean, deaths. When Santa Claus, The Easter Bunny, and The Toothfairy stop visiting the skeletons, Skelroy and Bonus decide to create a new nightly present giver. Whitney helps the skeletons get their boney bodies back from a giant beast known as, "The Fur!" Tired of the dogs in town always chewing on them, the skeleton duo end up growing a new kind of tree to get the dogs off their boney backs. When two vampire brothers start stealing the skeletons' stunts, Skelroy and Bonus compete in a stunt-off with them to find out who are the real Kings of the Monster Riders. We flashback to Ancient Rome where Skelroy and Bonus try a crazy chariot stunt involving a lion, a volcano, and a ticked off emperor. Skelroy can't enter any more wing eating contests without a stomach, so he goes on a search for one. When the skeletons' bikes get repossessed, Skelroy and Bonus try to raise the money by opening up their own theme park of bones. A famous shrink is hired to cure Skelroy and Bonus of their crazy stunts once and for all. Skelroy and Bonus try to reclaim a warehouse that has mysterious stuff linked to their pasts. The skeletons make a Buffalo Wing delivery for Whitney. And they're delivering to The President! When the skeletons install new and dangerous engines to their bikes, they end up unleashing an undead horror. The skeletons think life will be more merry once they join Robin Hood's Merry Men. When the skeletons hear that Death is coming for Whitney and June, they zoom off to try to stop The Reaper's plans. Skelroy wants buffalo horns and Bonus wants a rhino horn. So how do two crazy skeletons go about getting some? Check out this commercial that talks about what The Rebusquest Website has to offer. Commercial Comic. A mad scientist tries to dissect a silent e so he can learn the secrets of its vowel changing powers and use them for mischief. A town of peaceful sounding consonants get their peace disrupted by a gang of long and loud vowels. A surfing letter S gets speedy and superficial when he seats himself on a supersonic surfboard. A letter V works as a very valiant and versatile vet. Both AI and AY have a debate on who should be president of the A's. A parade in Pumpernickel Park giving praise to P words. When kids have nightmares, night terrors, or nighttime nuisances, a nymph named Nighty-Night N comes to make their nights nicer. A love story where a hard C and a soft C meet for a blind date and try to find things they have in common. Two explorers search for an ancient treasure box, only to encounter a giant riddle throwing X. When a lowercase j finds her dot missing, she goes through a crazy midlife crisis quest to find a new dot. Three letter G's form a superhero team, and they protect their city from gangster gorillas, giant germs, and gnawing gnats. A rich letter R spends the day bossing around his new vowel employees. OY and OI team up to save Christmas and Hanukkah from being spoiled and destroyed. A town's Watermelon Wallapalooza Wednesday gets ruined by a wicked wild W.
OU and OW have a powerhouse contest. A game show starring The Letter Y. A letter T tries to save the timeline from a technology taking T-Rex. Two letter K's see who can knock each other out first. A Halloween story where Long OO and Short OO put together two different kind of houses. A rapping letter H knows how to handle himself against horrid hecklers. A letter Z wants to get some sleep, but gets constantly interrupted by Z themed noises. A lowercase l learns he has a talent of laying down lines. If you have any comments and questions about my cartoons or if you just want to chat. Here's my e-mail address. cullenpittman@yahoo.com. Also, if you want to send me some fan art, fanfiction, or fan comics about my cartoons, feel free to send them to me at the same e-mail address and I'll post them in my Fan Creations page. Updated Dec 21, 2018. My good friend, Christian Groff, has created an official Rebusquest fan blog for fans to leave messages or comments. Just click onto this link to check it out.